On Tuesday and Thursday of this week we held Share sessions for classes LC and JC. The afternoons were full of games and activities. 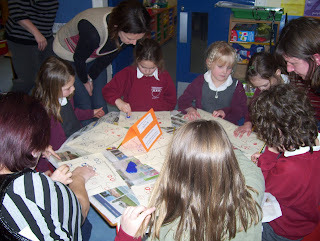 All the craft activities were based on the theme of Taditional Tales which is the current topic in Key Stage 1. Both afternoons saw plenty of parents and grandparents attend - 40 in all. They had a good time making symmetrical castles, crowns, clocks and much more. 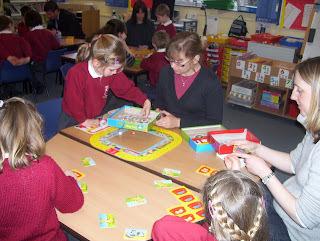 The games that were played are now available for the children to borrow and take home. Feedback from the children has been very positive. They loved having their parents in school.